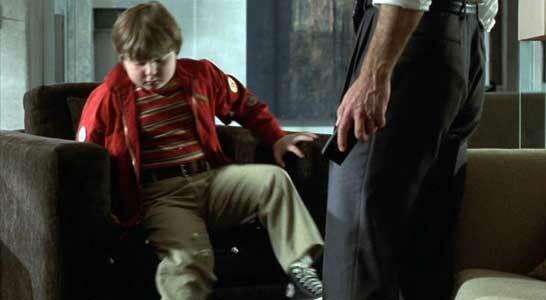 Spencer Breslin wears black high top Converse “Chuck Taylor” All Stars in the film. 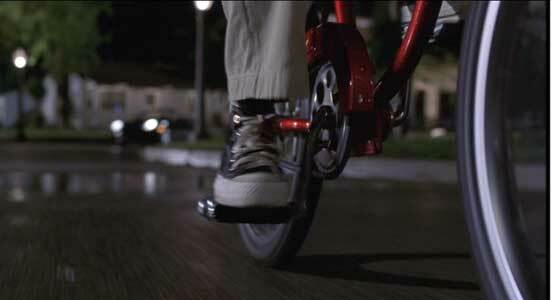 The mysterious kid runs away from Rusty’s house on his bike. As The Kid opens, we are introduced to Russ Duritz (Bruce Willis), a high-powered, no-nonsense, and sometimes caustic image consultant who specializes in making over celebrities or helping them through embarassing situations. In a revealing opening scene, we see Duritz seated on an airplane next to a television news anchorwoman coming from the south to Los Angeles. At first he tries to ignore her, but when she insists on asking him for career advice, he criticizes everything about her appearance, but tells her to keep her “y’all” as it will be her trademark. He also is rough on Janet (Lily Tomlin), his office assistant who is able to get by because she has a thick skin and good sense of humor, and he tends to be overly critical of Amy (Emily Mortimer), his charming young professional associate from England while at the same time he is attracted to her. Russ is estranged from his father, and when his father comes to his office to ask him to help move some childhood belongings from the attic, he has Janet come in and make an excuse so he can leave. Russ wants to know why the kid is there in his living room. Duritz’s outwardly successful but inwardly empty life is turned around when a mysterious eight year old kid (Spencer Breslin) suddenly begins interrupting his life. The kid is first spotted running around the yard in Russ’s property, having somehow breached his high security alarm system. Next he hears a sound, and later finds him inside the house, but when he gives chase the kid gets away on his bike. Russ follows him in his car, is led to a private airport, nearly run over by a red biplane, and then sees the kid running into a diner. When he goes into the diner, there is no one there, leading Russ to think he is having hallucinations, and seeks the help of a psychaitrist. But the next time he is home, Russ finds the kid in his house eating popcorn and watching a video. They talk for a while, discover they are the same person by comparing birthmarks and family background. 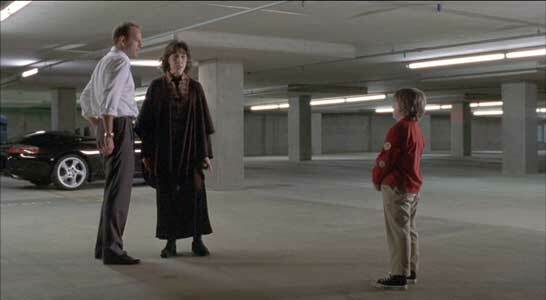 Russ still thinks he is having a hallucination, but when he won’t disappear, and Janet confirms that she can see him in a meeting in a parking garage. Russ and Rusty start talking about their lives and experiences, but when Rusty finds out that he doesn’t become a pilot (which is also symbolized throughout the film by incidents with the red biplane), have a dog, or have a woman around the house he thinks that he has grown up to be loser. As the story progesses, eventually the two begin to bond, and the film takes on an additional supernatural element, as Russ and Rusty work together to revise childhood scenes from the past, particularly a playground fight involving a bully and cruelty to a dog. The story then turns to Russ’ personal life, as he explores the relationship with his stern father, his cold treatment of others, and whether his romance with Amy will be rekindled. Janet confirms that Rusty is real when she meets him for the first time. Disney’s The Kid (what marketing genius decided that the title needed an ad!) was directed by Jon Turtletaub and written by Audrey Wells, but also owes a conceptual debt to both Dicken’s “A Christmas Carol” and the recent Toby Emmerich/Gregory Hoblit film The Frequency. The inclusion of the Disney name implies that this is a movie for kids, but it really is more for an adult audience with its emphasis on Russ Durwitz’s mid-life crisis and sarcastic approach to most situations he encounters. Although you may be put off by the behavior of the two main characters -- Russ and his alter ego at age eight -- the film ends up having heart and gives you a “feel good” attitude as you see them begin to help each other. Bruce Willis has developed an effective sideline from his previous action roles by showing us well-honed comic skills that are put to work in The Kid. Spencer Breslin appears to be about as opposite as you can imagine for someone playing a young Bruce Willis, but as the movie progresses you begin to see how this pudgy and whining kid could eventually turn into a polished image maker, especially when Breslin mimicks the facial tics, temperament, and other mannerisms of the Bruce Willis character. There could have been more of Lily Tomlin and Emily Mortimer in this film, as they both deliver brief but delightful performances, but the film de-emphasizes their roles to focus on the interaction between the two alter egos. Turtletaub and Wells give us a typical Disney movie, with family values affected by elements of fantasy but the audience that will enjoy this the most are those “kids” over 30 years old. Rusty finally finds the courage of his convictions in the schoolyard. Russ tussles with Rusty, trying to teach him about self defense. 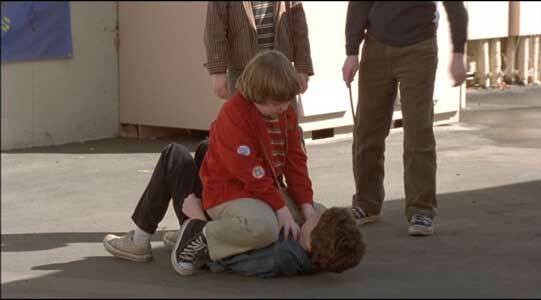 Spencer Breslin in his role as “The Kid” Rusty, wears black high top chucks throughout the film. There are a few closeup shots during the film, like when Rusty looks for the scar on his leg or lies down and sings a nursery rhyme. But the best scene is when Russ, along with his professional boxer friend Kenny (Chi McBridge) show Rusty how to defend himself. Russ’s friend Kenny shows Rusty how to box. The Kid. (2000) Bruce Willis, Spencer Breslin, Lily Tomlin. Directed by Jon Turteltaub. Categories: Comedy, Family.